Nick Pivetta faltered in the opening frame, surrendering three runs on four hits allowing the Padres to set the tone in a 10-2 win over the Phillies on Sunday afternoon in the first game of a doubleheader. Carlos Asuaje scored a pair of runs and collected a pair of doubles for the visitors in the winning effort. Rhys Hoskins clubbed a solo shot for the Phillies in the bottom of the first, then scored the Phillies second run of the afternoon on a Nick Williams fielder's choice in the fifth. 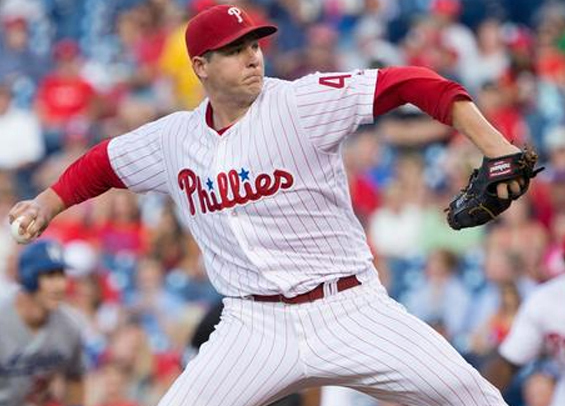 Trailing 4-2 entering the sixth, Pivetta was lifted after runners reached the corners via a pair of singles. Edubray Ramos came on in relief and Carlos Villanueva lofted a ball to shallow center that bounced off Cesar Hernandez, enabling Eric Hosmer to cross the plate to give the Padres a 5-2 lead. It appeared Hernandez had a play on the ball, but he backed off at the last second as the ball bounced off his right arm. Two more runs would score in the inning to increase the Padres' lead. The Phillies threatened in the seventh with the bases loaded, but Aaron Altherr entered as a pinch-hitter and struck out and Scott Kingery popped up to second to thwart the threat. Ramos faced two batters in the sixth before hobbling off the field with an apparent left leg injury. The Phillies finished the contest 0-for-10 with runners in scoring position. Former Phillie Freddy Galvis finished 3-for-5 with a pair of RBIs and a run scored. The nightcap of the doubleheader is set to start at 6:05 P.M. Righty Vince Velasquez will be on the mound for the Phillies opposing Padres righty Luis Perdomo.